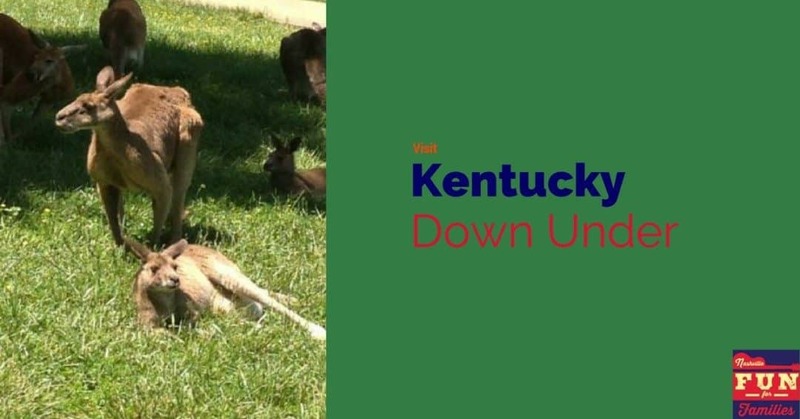 Drive 90 minutes north on I-65 and explore another continent – get a taste of Australia (at least it’s wildlife) at Kentucky Down Under. Plan to spend the day here – there is lots to see and do! Take Exit 58 off I-65 and turn at the Love’s gas station on the left. You can take a picnic into the park and Love’s conveniently has both a Subway and McDonald’s to pick up food on the way in. Alternatively, bring food from home or eat at the cafe in the park. Park your car in the lot in front of the turquoise building and be ready for a day of fun. Once you buy your tickets you exit the visitors’ center through the back and climb a large hill. It is paved and stroller friendly, but it is a distance to the animal and cave areas. If someone in your party needs assistance I did see a golf cart go by several times during our visit. At the top of the hill, the picnic shelters are to your right (along with the cave tour exit and air rifle range) and the animals, cave tour and gift shop are to the left. We started at the gift store and played in the rock mining area. You can purchase a bag of silt with semiprecious gems in the gift store to wash and discover your treasures.There is also several different types of fudge available with free tasting. Bathrooms are available as well. This is also where you will meet for your cave tour – when you buy your tickets you will be assigned a tour time. 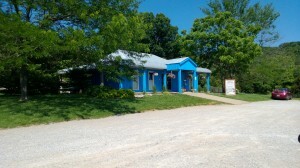 Once your kids are done playing in the water continue to the left past the gift store and explore the bird area. There are many different species of birds that are very friendly and used to people. There is even a parrot that will say “hello” and “Aflac”. The dingoes are in the same area so be sure not to miss them. There is plenty of shade and the path is smooth gravel. Past the birds is the lorikeet feeding area. You are given one cup of free nectar with your admission and additional cups can be purchased with a token which are $1 each. The birds will swarm you as soon as you walk into the cage so be sure to hold tight to your cup. Both my children were enthralled with the birds and we had to make a second visit on our way out of the park. From here you have a choice. The kangaroo petting area runs tours continuously every 15 to 30 minutes depending on the crowds. There is also a sheep shearing and cow milking demonstration that happens every 2 hours, so plan accordingly.We toured the kangaroo habitat during one of the sheep shearing tours which left us with only 1 other family on our tour. A guide will walk you through the kangaroo and emu enclosure allowing you to see and pet the animals. The emu is especially tame – our guide asked her to lie down – which she did and then we were all able to feel her back and feathers. The kangaroos were equally as tame. They will happily lie down and allow you to scratch their backs. We then walked up another small hill and saw the rest of the sheep shearing and cow milking show. Visitors are invited to milk a cow, which is a big hit with the kids. After our kangaroo experience we had lunch at the open air cafe. The food was good and reasonably priced. There are restrooms in the same building as the cafe. We then ventured up to the overlook which provided a beautiful view of the Kentucky country side. On our way back toward the gift center for our cave tour we caught a reptile show. One of the staff members showed and discussed a turtle, a blue tongue skink (lizard) and a horned lizard to the audience and came around and let everyone touch the back of each animal. Our cave tour was scheduled for 1 PM and there was a large group of 20 or so that was scheduled at the same time. The tour is not stroller friendly, but Tamzin (3) had no problem keeping up. It is a short 15 – 20 minutes. The cave is well lit and the paths are made of sandstone to help provide traction. The walkways are wet and you may get a bit muddy. There are also some steep stairs that the guide encouraged taller visitors to climb like a ladder. The cave tour exits near Kentucky Down Under’s newest attraction – an air rifle range. For an additional $5, each guest can shoot for 20 to 30 minutes. The guns are chained to a table so you can not shoot at anything to the side or behind you. You can only aim at the targets. This was Declan’s favorite area – but what did you expect for an 8 year old boy. 🙂 Tamzin and I spent this time at the gift store and purchased a pound of fudge to take home. We had intended to tour other attractions in the area, but we had such a full day (arriving at 10 AM and leaving at almost 4 PM) that we are planning to return to the area another time. I hope you enjoy Kentucky Down Under as much as we did! And as we exited I found out there is more fun to come soon – the park has new owners that plan to do some expansions. There are dingo pups that will be available to view in a few weeks. In addition, there was mention of river otters, bats and even penguins being added in the near future.